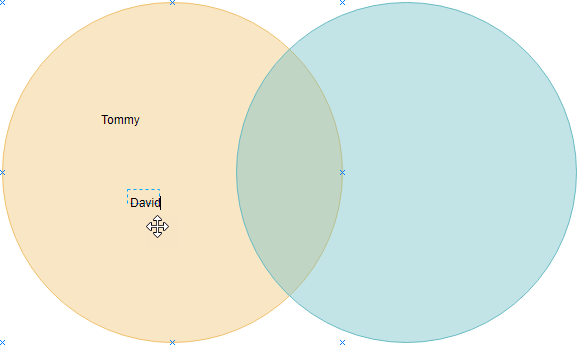 How to Create Venn Diagram? Current: How to Create Venn Diagram? Want to create Venn Diagram? We will provide you with an introduction on Venn Diagram and let you know how you can create Venn Diagram with our Venn Diagram software. Venn Diagram, also called Primary Diagram, Logic Diagram or Set Diagram, is widely used in mathematics, statistics, logic, computer science and business analysis for representing the logical relationships between two or more sets of data. A Venn Diagram involves overlapping circles, which present how things are being organized, their commonality and differences. Venn diagrams are effective in displaying the similarities or the differences between multiple data set (usually two to four). Venn diagrams also describe the result of unifying several data group. They can also describe the overlapping responsibilities of two organization / team. Listed below are some Venn diagram examples. As you can see, Venn diagram consists of overlapped oval shapes, showing content of data set as well as the data that co-exists in multiple groups. Note that instead of ovals, Venn Diagrams can also be formed with triangles, rectangles, squares, and other shapes, although uncommon. 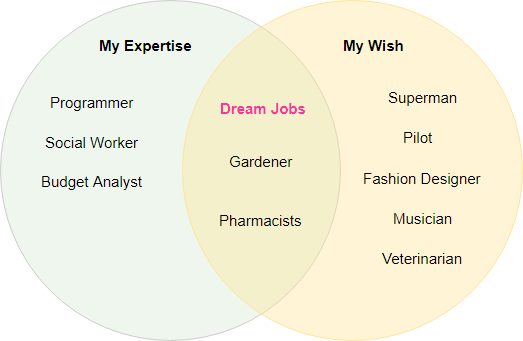 How to Draw Venn Diagram? Select Diagram > New from the main menu. 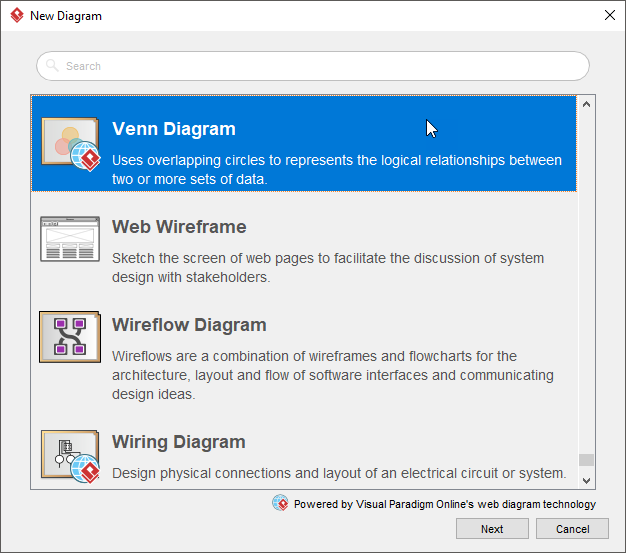 In the New Diagram window, select Venn Diagram and click Next. 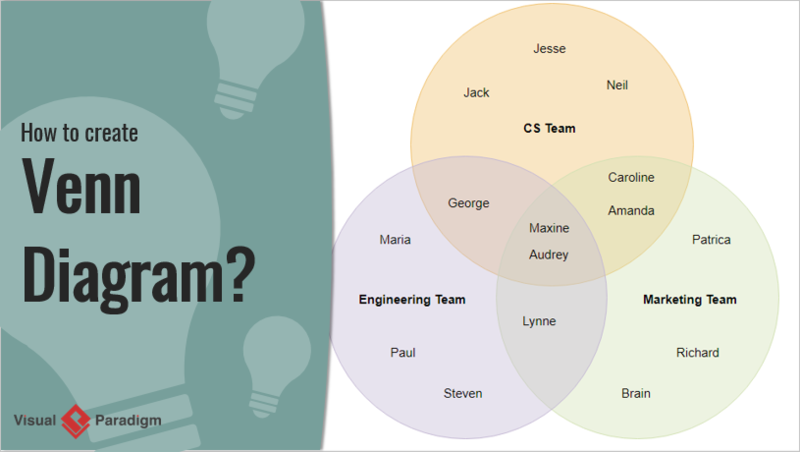 Select an existing Venn Diagram template, or select Blank to create from scratch. Click Next. Enter the diagram name and click OK. Drag and drop the oval shapes from the palette onto the canvas. Double click to create a text label. When you finished, you can export the diagram as image (JPG, PNG, PDF, SVG, etc) and share it with your friends or co-workers (Project > Export > Active Diagram as Image…).